Grab your umbrella - it's going to rain. Hard. There is a risk of further flash flooding in Cork, Met Éireann has warned. IT’S A DRY start around Ireland today – but don’t let that lull you into a false sense of security. Much of the country will be breaking out the wellies later, as a band of what Met Éireann calls “very heavy rain” moves in from Britain across the Irish Sea. Forecasters have warned there could be further flash flooding in Munster, where several Cork towns were left under water last week. 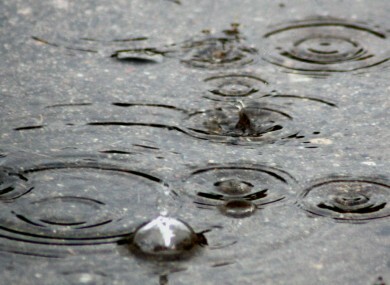 A weather warning is in place, with thunder expected and also a risk of spot flooding in some areas of Leinster. The north-west is likely to be the best place to be, as the rain moves across the south of the country from east to west. If it’s any consolation, temperatures will stay warm – reaching 21 to 22°C in some areas. And the weekend should be better, staying mainly dry in most areas with only scattered showers according to Met Éireann. Email “Grab your umbrella - it's going to rain. Hard.”. Feedback on “Grab your umbrella - it's going to rain. Hard.”.